The award-winning Isle of Arran Distillery will release the final edition in its highly celebrated Smugglers’ Series on the 12th July. This bottling marks the conclusion of the much-lauded trilogy which honours the exuberant character of those striving to outwit the Government’s representatives in the pursuit of the production of the famed ‘Arran Waters’. Like proceeding volumes, ‘The Illicit Stills’ and ‘The High Seas’, Smugglers’ Series vol.3: ‘The Exciseman’ is presented in packaging that mimics a beautiful hardbound book, complete with a cut-out compartment that conceals the bottle. The Madeira casks used in this final volume, are similar to the ones utilised by Arran’s illicit distillers, who often stored and transported locally produced whisky in old Madeira casks brought over from the continent by their smuggling counterparts. The use of Quarter Casks is a nod to the type of small vessels which would have been the easiest to transport. The resulting liquid is complex, full of character and a wonderful way to end a series which has so perfectly paid tribute to the independent characters of Arran over the centuries. James MacTaggart, master distiller of the Isle of Arran Distillery said: “Smugglers’ vol.1 and vol.2 were tremendously popular, selling out within days. “There is a real desire for whisky with a story, something the Smugglers’ Series has in abundance. 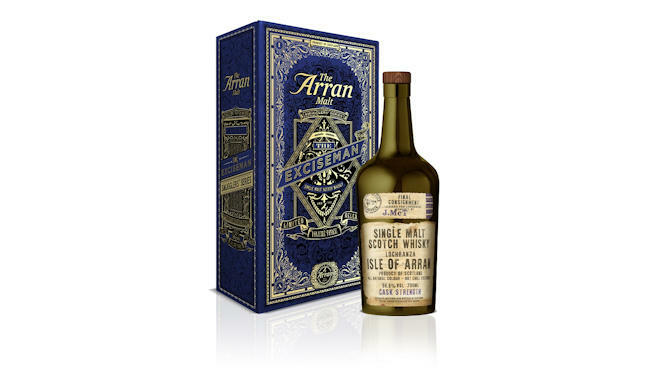 The iconic citrus notes of the Arran Malt are at the fore of ‘The Exciseman’, mingling with scents evocative of the outdoors and a hint of coastal character. Notes of apple and vanilla coat the tongue without a hint of dryness. The addition of water opens up the complexity beautifully and reveals a lighter sweetness of candied lemon. A long, luxurious and yet delightfully fresh finish give a lightness of character whilst the body remains solidly complex and robust. Non Chill Filtered and with no artificial colouring, Smugglers’ Series Vol.3 ‘The Exciseman’ is bottled at Natural Cask Strength 56.8% abv. A limited edition release of 8,700 bottles worldwide, will be available online from 11am on the 12th July at arranwhisky.com and at specialist whisky retailers – but is expected to go fast.